You can expect us to bring an unsurpassed level of professionalism and superior craftsmanship to your commercial building project in the Lake Norman, NC area. Commercial Building in Lake Norman – With more than 30 years of experience in the design and build of luxury custom homes, you can expect us to bring an unsurpassed level of professionalism and superior craftsmanship to your commercial building project. Though commercial and residential buildings vary in purpose, both types of buildings deserve the same amount of design, style, and layout considerations. Our team at Chad Goodin Signature Homes will exceed your expectations. You can be sure that we will give equal care to both functional layout and sophisticated design. A commercial building is an extension of your brand, and it should demonstrate your level of dedication to your customers, your employees, and your product. Your employees will appreciate a building that promotes productivity, and your customers will be welcomed into your business with a comfortable, welcoming design. A commercial building must be constructed in compliance with local building regulations and codes. That is why it is important that you choose a company that is experienced in large, complex commercial projects. With Chad Goodin Signature Homes, you are receiving more than just a commercial building contractor – you are receiving years of luxury design experience. If you are ready to help your business become an example of modern, superior design, contact us at Chad Goodin Signature Homes today. With several well-established relationships with local vendors and architects in the Lake Norman, NC area, we are ready to begin the design and construction process on your new commercial building today. We work quickly and efficiently to ensure a workable timeframe. Contact us today for more information or to schedule a consultation. 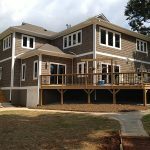 At Chad Goodin Signature Homes, we provide high-quality commercial building services in Mooresville, Cornelius, Davidson, Huntersville and the surrounding Lake Norman area of North Carolina.